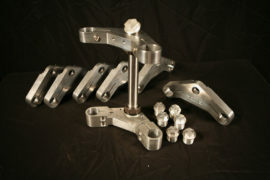 Ripple Rock Racers new GL1000 Billet Top Triple fits the GL1000 37mm forks from 1975-79. The triple is drilled to accept the stock gauge cluster using our Gauge Bracket and the stock ignition using our Key Mount. This top triple will work with our Deluxe Mini Gauge LED compatible bracket. The top triple also has provisions for our Key Mount which again allows use of our Dual Mini Gauge Bracket with the stock ignition mounted to the top triple. GL 1000 Forks fitted to CB750 are a popular cafe racer “upgrade”. Using the complete GL1000 front end on a CB750 from 69-78 allows the builder to have stiffer 37mm forks and double disc brakes complete with a 19″ front rim. This front end affords slightly more relaxed and more stable steering due to less offset of the GL1000 triples. When fitted with an 18″ front wheel, the CB750 will steer more quickly and still have stability afforded by the increased trail.